The Hydrology9 is the 1st ever, water filtration vaporizer engineered for loose leaf cannabis. And it’s absolutely fantastic. 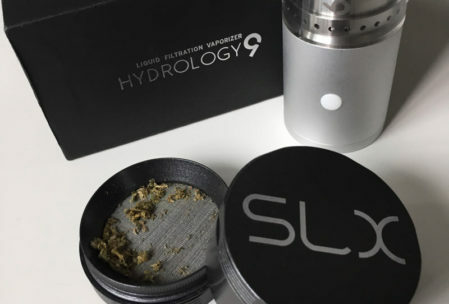 We were beyond excited to try the Hydrology9 vape when we first heard about it this Summer. Then we got to check it out first hand when we dropped by the VapeWorld booth at CHAMPS Trade show in Vegas earlier this year. 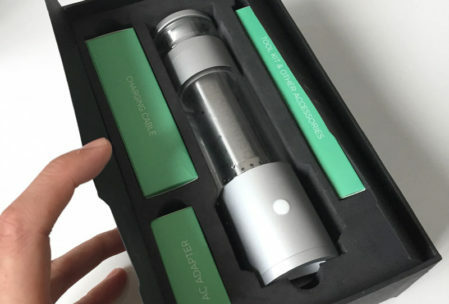 We’ve gone through many dry herb vape reviews, but we’ve never seen a vaporizer quite like this before. There are a few vapes out on the market that offer bubbler attachments (sold as add-ons), but nothing comes close to the quality in the engineering and design of the Hydrology9. 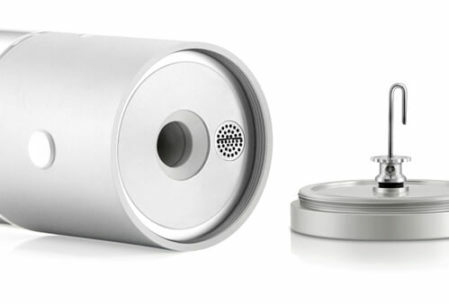 This vaporizer is the only dry herb vape on the market with a built-in water filtration system that performs flawlessly. The Hydrology9 vape has some other unique features as well. It features a colorfully, glowing light show display, leak-proof design, and a built-in loose leaf stir (patent pending) to ensure your cannabis heats evenly. 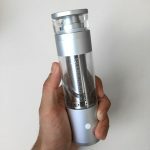 The water filtration on the Hydrology9 allows for some of the best tasting and coolest vapors ever produced by a dry herb vape (also check out our review on the Zeus IceBorn air cooling system). The Hydrology9 is raising the bar with its innovative features, never seen before in the vape market. The body of the vape is made with “spacecraft grade” aluminum alloy and borosilicate glass for the water chamber and mouthpiece. The internal oven or heating chamber is made from food grade porcelain. 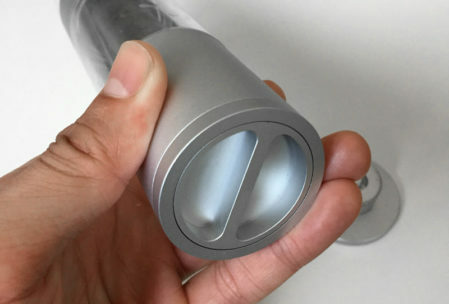 The chamber is cylindrical and narrow, similar to that of the FlytLab LYFT dry herb vape that we’ve reviewed previously. Its streamlined, cylindrical design and fusion of modern materials make the Hydrology9 quite a spectacle (and that’s before even turning on its LED light show display). 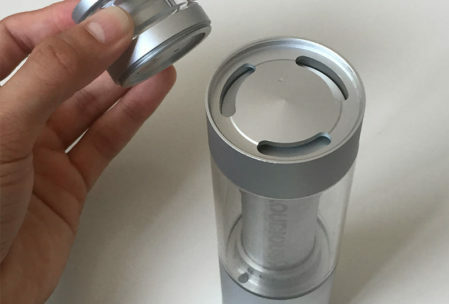 Aside from being the 1st built-in water filtration dry herb vaporizer, the Hydrology9 is also unique in that it hits similar to a bong or waterpipe. While almost every single vape is designed for your lips and mouth to go around the outside of the mouthpiece, with the Hydrology9, your lips form a seal on the inside of the mouthpiece. The stir built into the oven lid at bottom of the Hydrology9 is a really useful feature. 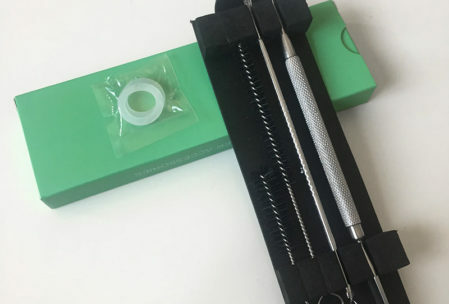 This is another first for the industry as we’ve never seen this feature with any existing dry herb vapes. 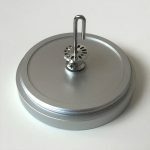 Effortlessly stir up the roasted cannabis from within the heating chamber by twisting the dial on the lid. No need to manually stir or dump out the bowl for repacking. If you’ve ever used a convection vape like the PAX dry herb vape, you’ll find the built-in stir convenient. Because convection heating involves the oven walls (or heating element) to make direct contact with the dry herb, the limited surface area causes the middle of the bowl to remain untouched (uneven vaping). The stir reaches the middle of the oven, mixing the entire bowl which ensures a nice, even vape. With the Hydrology9’s built-in stir, uneven heating is a thing of the past. The Hydrology9 can be completely disassembled so that it can be fully cleaned as good as new. Materials: Space grade anodized aluminum alloy body. Borosilicate Glass mouthpiece. Food grade porcelain chamber. Battery: 2000 mAh lithium polymer battery. 2-3 hours to fully charge. Lasts approximately 15 sessions. Takes approximately 60 seconds to reach optimal heat. 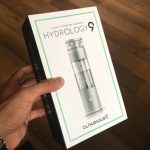 The Hydrology9 vape is extremely easy to use. Its simple, one-button design makes it a no-brainer. There are a few things to note as this isn’t your typical vape, but you’ll quickly get the hang of using it. 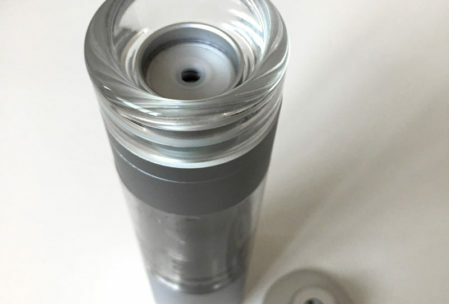 Unscrew the top portion of the vaporizer from the base to expose the opening where you fill the chamber with water. Fill it up about half way with clean water then screw the top portion back on. With the lid covering the mouthpiece, flip the whole vaporizer upside-down and unscrew the oven lid. Pack a bowl of well ground up herbs into the chamber, then screw the lid back on. Flip the device right-side up and power on! When the device reaches the desired temp, it will remain on for 120 seconds. Then it will switch to standby mode (represented by a blue glow) and power down after 60 seconds. If the device is left on by accident, it will power off automatically within 10 minutes. TIP: Keep the cap on the end of the mouthpiece to prevent leaks whenever you turn the vape upside-down. 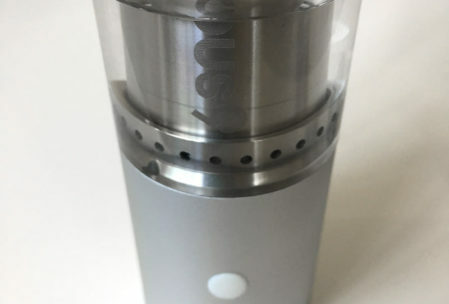 Our first impression of the Hydrology9 upon unboxing left us in awe as this is such a cool and unique looking vape. You’ll immediately find that it’s heavier than most “portable vaporizers” but very sturdy and well designed. You can definitely tell it’s crafted from quality materials and feels similar to the original glass bottle of Voss water. You may share our initial concern about mixing water with electric and battery-powered devices. It just sounds like a no-no. But rest assured. This thing works as promised when used right. The Hydrology9 includes a full user manual and quick start guide to get you going. At first, we were overly cautious, avoiding any drips of water from seeping into buttons, USB charging ports, and any other places that don’t like water. Then after sealing the device back together, we were still nervous that the vaporizer would, in fact, hold up to its leak-proof claim. The mouthpiece contains a ball-valve that helps to prevent leaks. 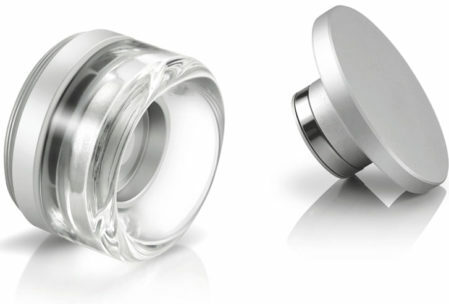 The lid of the mouthpiece protrudes slightly to plug the air way, providing an additional seal. 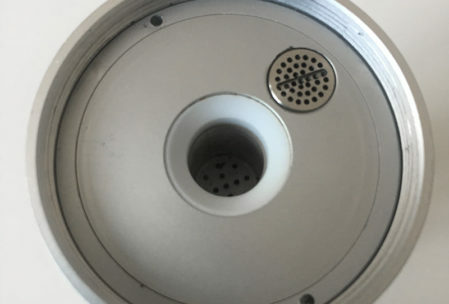 We experienced a leak coming from the seams where the top portion (glass mouth piece with aluminum attachment) screws on to the aluminum top of the water chamber. Just as the manual advised, simply screwing the top mouthpiece down tighter to the body of the vape did the trick. Ta-da! No more leaks. Ever. To load the Hydrology9 with dry herbs, you have to flip the vape upside down to unscrew the oven lid. Once we became confident that the vaporizer was leak free, the Hydrology9 really started to shine. We loaded up the porcelain chamber with about 1/4 of a gram of well ground up loose leaf herbs (using the SLX non-stick grinder) and packed it down a bit. Then we fired up the vape and waited for the oven to warm up while amused by the glow of the LED lights dispersed throughout the water chamber. For the 1st session, we tried the lowest heat setting (blue light) which vaped super clean and smooth, producing a surprising amount of vapor. It was very easy on the throat and lungs, and tasty too. For the 2nd session, we tried the 2nd lowest setting (yellow) which was again, surprisingly light on the inhale relative to the massive vape cloud released on exhale. For each consecutive session, we upped the temp setting. Ultimately we found ourselves enjoying the 2nd or 3rd heat settings (out of 5 settings) the most. For us, medium to medium-low heat strikes the perfect balance between flavor transfer, ease on lungs/throat and puff size. You can most certainly up the ante if you’re into chasing those massive clouds. In the end, the water cools down the vapors making even the hottest hits tolerable. This vape definitely makes for great entertainment. With its flashing LED lights and novelty features, this thing is a hit. We unveiled the Hydrology9 at a fight night viewing party for the epic McGregor vs. Mayweather fight. It drew so much attention as everyone wanted to try it. Suprised by how smooth and flavorful the hits are, we didn’t hear a single complaint. Overall, the Hydrology9 is an outstanding dry herb vaporizer. It’s innovative water filtration system and quality build makes it an absolute pleasure to use. Rarely will you find a dry herb vape that transfers flavor quite this well while at the same time providing massive hits that are surprisingly crisp, clean and smooth. Using the Hydrology9 is a unique experience because it’s just so different from every other vape out there. The Hydrology9 is a sizeable vaporizer (about the size of a water bottle) and a bit too heavy to be a true portable vape. We probably won’t be lugging this thing around with us everywhere like we would with a vape pen. But, the Hydrology9 has definitely earned a permanent spot on our desk. It’s our new go-to when we’re reaching for a dry herb vape. The Hydrology9 dry herb vaporizer is available for $250 directly through Cloudious9 or authorized distributor VapeWorld. The vaporizer is backed by a 2-year manufacturer warranty. 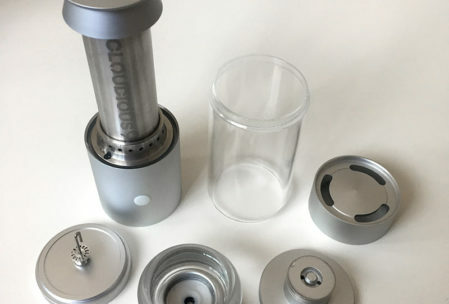 For a limited time, order the Hydrology9 through VapeWorld to take advantage of FREE shipping along with a free glass jar and 4-piece aluminum grinder. Use discount code “VAPELIFE10” at checkout for an additional 10% off your entire order.